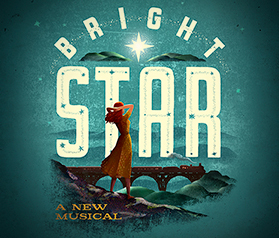 A couple things piqued my interest when I saw that a new musical, “Bright Star,” written by Steve Martin with music by Edie Brickell, was set to open on Broadway. First, I’d always wondered what had “happened” to Edie Brickell, who seemed to have completely fallen off the radar after producing what were, in my opinion, two of the best albums of the late-eighties/early nineties: the double-platinum Shooting Rubberbands at the Stars (1988) and Ghost of a Dog (1990). She did not, I am relieved to discover, marry Paul Simon and call it quits: in fact, she’s been busy. Real busy. “Bright Star” tells a sweeping tale of love and redemption set against the rich backdrop of the American South in the 1920s and ’40s. When successful literary editor Alice Murphy meets an ambitious young soldier just home from World War II, their connection inspires Alice to confront a shocking incident from her past. Together they discover a long-buried secret with the power to transform their lives. So, just to recap, there’s a brand-new Broadway musical with music by the insanely talented Edie Brickell, book by Steve Martin (who needs no introduction), set in Asheville, North Carolina, starring a female writer at the height of her powers? I can’t buy tickets fast enough. For more information on “Bright Star,” click here. This was written by charles. Posted on Tuesday, January 12, 2016, at 9:31 am. Filed under Uncategorized. Tagged Asheville, bright star, carmen cusack, edie brickell, steve martin. Bookmark the permalink. Follow comments here with the RSS feed. Both comments and trackbacks are currently closed.